Today our expert guest is Patricia Moreno, the trailblazing founder of spiritual fitness, a methodology that borrows many of the lessons from cognitive behavioral therapy. She is leading a conversation about the importance of each and every one of us making a vow to wake up and be a positive and effective part of the raising of the consciousness of the planet. Although Patricia has achieved a very high level of success, it certainly didn’t happen overnight. Things didn’t go as well as she expected in her early career ventures, reaching a head when she started using crystal meth, and this is in large part due to the baggage she was carrying from childhood. Patricia grew up as one of the 9th of 11 children. She was raised with the idea that a woman’s self-worth and is inherently tied to her looks, and she and her seven sisters adopted the value that looking great and being thin were paramount. As a result, they inherited a lot of their mother’s fears and self-doubts. This really came to a head after she got her dream job hosting a live workout show. About a year into the show, a producer said she had gained to much weight – and the shame spiral was beyond anything she’d ever experienced. As a result, she turned to crystal meth as her new diet. She realized that it wasn’t her that was broken, unable to keep off weight with just diet and exercise – the recipe was wrong. So she started working for a cause and a mission: to help people break free from this identity that our body is our social currency, and to help people achieve their goals in a more holistic and loving way. And for almost two decades now, Patricia has been spreading this message and changing lives. 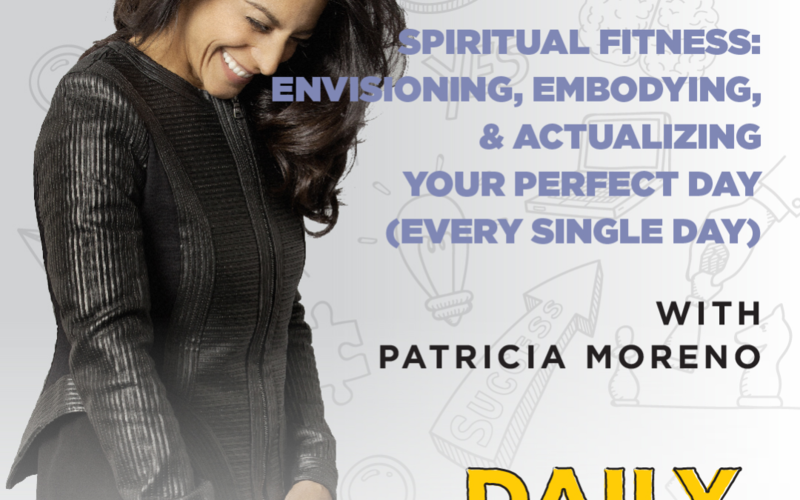 After years of training and studying with personal optimization experts, mindset scholars, and spiritual teachers, Patricia created her own practices to integrate spiritual fitness into the lives of hundreds of thousands worldwide. Her signature movement method, intenSati, has been changing lives for over 15 years, and this embodiment of positive states through movement is still an integral part of her work. In an effort to give everyone access to unlocking their highest potential, she created a year-long digital program that combines a powerful guided morning practice with unwavering daily accountability and consistency called Sati365. In just two years, the program has seen astounding results by simply empowering members to envision, embody, and actualize their perfect day, every single day. Thank you for joining us on The Daily Helping with Dr. Shuster. Subscribe to the show on iTunes, Stitcher, or Google Play to download more food for the brain, knowledge from the experts, and tools to win at life.